If you own a motorcycle which weighs more than double your body weight then cribbing about daily parking issues will be your regular task. Heavy motorcycles for example cruisers and adventure bikes are a trouble when taking them in or out of tight parking spaces. Since most of such bikes are humongous in dimensions and weight they need a special reserved parking space in your garage. But since not everyone has a garage which can accommodate such bikes with ease, they are always a pain when it comes to the parking. Also, such bikes have a very limited turning radius which makes it very tricky for them to be turned in limited spaces. To overcome the parking issues in heavy bikes, Grandpitstop has come up with a one step solution which makes it easy for such bikes to be parked in your garage with minimal effort. The Center Dolly is such a tool which provides 360 degree movement to the motorcycle with zero physical effort. 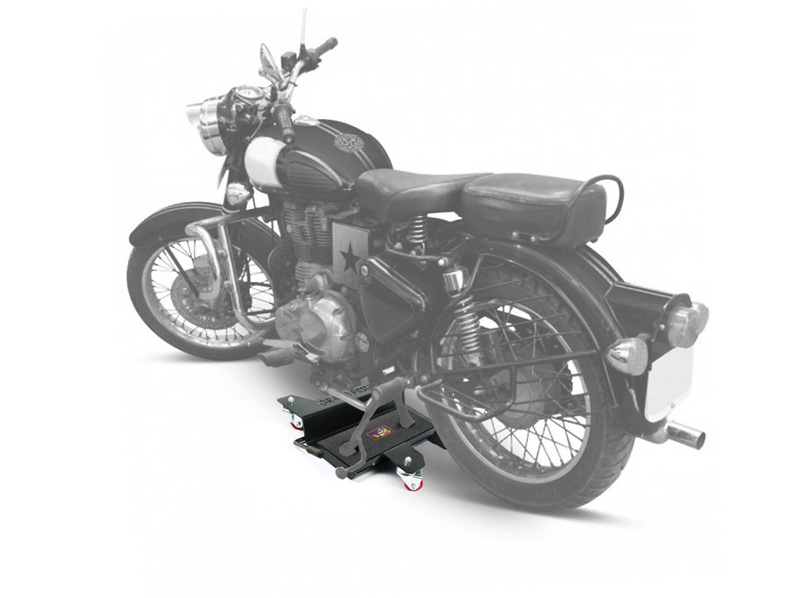 The Center Dolly works as a tray with wheels on which the motorcycle can be placed. The user needs to place the center stand of the bike on the dolly. Once the bike is placed on the Center Dolly it can be moved in any direction with just a push. Since the wheels are free to do a 360 degree movement, this doesn’t restrict the bike’s movements allowing it to enter and exit tight parking spaces with ease. The Center Dolly is made up of high grade steel on which the motorcycles of all weight and dimensions can be parked safely. 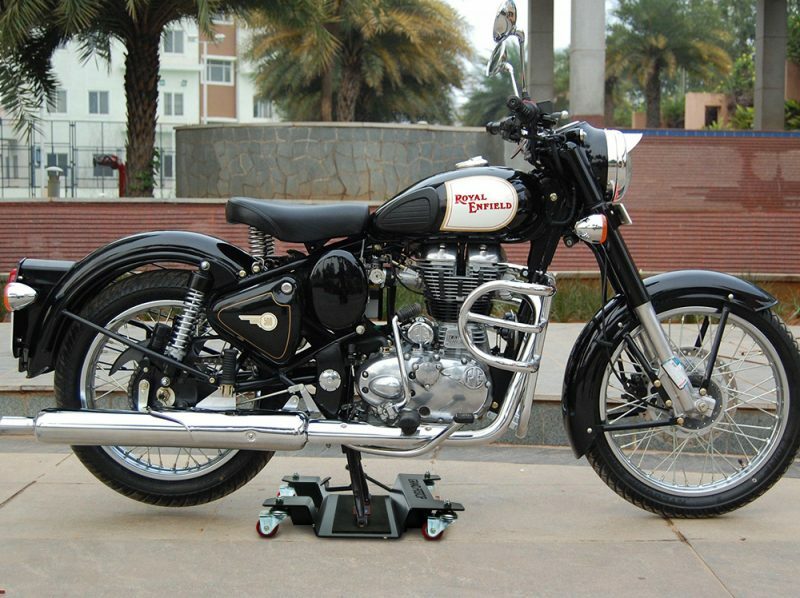 It is a very critical tool for motorcycle workshops where parking space is always a challenge. And thus the available space can be utilized very efficiently with the use of Center Dolly. Does it fit only specific bike models? The Center Dolly is a universal solution for all things parking. It accommodates motorcycles of all make and kind. The important thing to note is that the motorcycle should have a center stand to make use of the Center Dolly. It only weighs close to 8.4 kgs and comes in a compact design, hence is very handy to use and easy to carry. How much does it cost and how can I place an order? The motorcycle Center Dolly is available for pre-order at the GrandPitstop.com and currently retails a special discounted price tag of Rs 3,500 till the product gets officially launched. Do let us know what you think about the same in the comment section below and stay tuned as blog.grandpitstop brings you much such interesting motorcycle stuff. Click here to know more GRANDPITSTOP..! !